At Johnson & Johnson, safety is a core value that is supported by Our Credo. We believe a safe workforce and a healthy workforce go hand in hand, and that keeping our people safe is part of our broader mission to improve health for all. The culture of safety at Johnson & Johnson inspires every employee to make safety not only a way of working, but also a way of living, all day, every day. Our operations must first and foremost be fundamentally safe – well-designed, and with workplace hazards sufficiently controlled. Our employees should have the appropriate tools, training, and education to execute their jobs safely and report unsafe conditions, and it is our responsibility to ensure that they do. Leaders are accountable for the safety of their operations, but importantly, we believe good safety behavior is the responsibility of all employees. We continuously evaluate, leverage, manage and nurture our culture so that employees at all levels and across all sites have a shared understanding of the safety values and behaviors at Johnson & Johnson. Our commitment to employee safety extends beyond the time spent at the workplace; we provide resources to help our employees always keep safety top of mind, whether at work, at home, or on the go. Our Environmental, Health & Safety (EHS) Policy, along with our set of Worldwide Environmental, Health, Safety & Sustainability Standards (Standards), set minimum requirements for our health and safety practices at our facilities and off-site work locations around the world. Workplace safety is overseen by the Vice President of the Environmental Health, Safety & Sustainability (EHS&S) organization. Enterprise-wide safety performance is discussed with, and reviewed by, the Johnson & Johnson Executive Committee and the Board of Directors’ Regulatory, Compliance & Government Affairs Committee. We encourage, but do not require, third-party certification to the Occupational Health and Safety Assessment Series management system (OHSAS 18000). In 2017, 33% of our manufacturing and R&D sites were certified to OHSAS. We have rigorous programs in place to ensure on-site occupational safety, as well as contractor and fleet safety. Johnson & Johnson has standardized a Safety Culture Roadmap to empower individuals and teams around the world. This systematic safety culture process includes standardization of both Integrated Ownership of Safety Systems (IOSS) and a safe behavior program called "Safe Decisions for Life" to proactively shape our safety culture. The Roadmap also enables leaders to engage employees at all levels, establishing a more robust culture that extends beyond baseline compliance to more holistically manage risk. Tools are provided to help assess, improve and scale workplace safety initiatives and programs. Diagnostic assessments that examine leadership, safety education and awareness, as well as processes and habits, are conducted at our manufacturing and major R&D locations, as well as among our larger fleet teams. Based on these assessments, the sites develop action plans to address areas of opportunity and initiate improvement activities. Such "reflection assessments" are repeated every two years to measure improvements and provide organizations with insight into their culture's performance. To continuously foster our culture of safety, EHS&S provides a suite of training programs for EHS&S professionals and the general employee population across Johnson & Johnson at the enterprise, regional, campus and site levels, as well as field sales and service groups. The safety of contractors with whom we work is also managed and tracked by our Company. Large capital construction projects follow a formal safety action plan documented in a construction safety plan. In January 2017, we held our first annual Safety Day at our Consumer segment manufacturing sites around the world to celebrate and deepen our commitment to workplace safety. The sites paused manufacturing for a full day for dialogue and discussion with employees to reinforce the importance of workplace safety. Teams engaged in learning, reading, and networking about safety topics such as electrical safety, fire prevention, fork lifts, housekeeping, and machinery. Based on our successful inaugural launch, we are rolling out Safety Month across the enterprise in 2018. Leveraging leading indicators of safety—such as Good Saves, where our entire population is encouraged to recognize, report, and resolve hazards—is a key enabler of our strong safety results. In addition to recognizing overall hazards, we have a process for recognizing and separating out high hazard situations that could result in Severe Injury or Fatality (SIF). Our SIF prevention program, called "See Something, Say Something, Do Something," creates laser focus on these hazards and drives risk reduction by proactively addressing these hazardous situations with expectation of the highest value controls possible to prevent SIFs. Our goal is for drivers around the world to return home safely at the end of each day. For us, safety isn’t just something that starts and stops at the Johnson & Johnson door; it is a part of leading a healthy and happy life. We emphasize the importance of keeping a safety mindset while driving for work, and also during our commutes and when we are out enjoying time with family and friends. Our commitment to road safety education extends throughout our enterprise, with additional, community-based initiatives in countries where we do business. 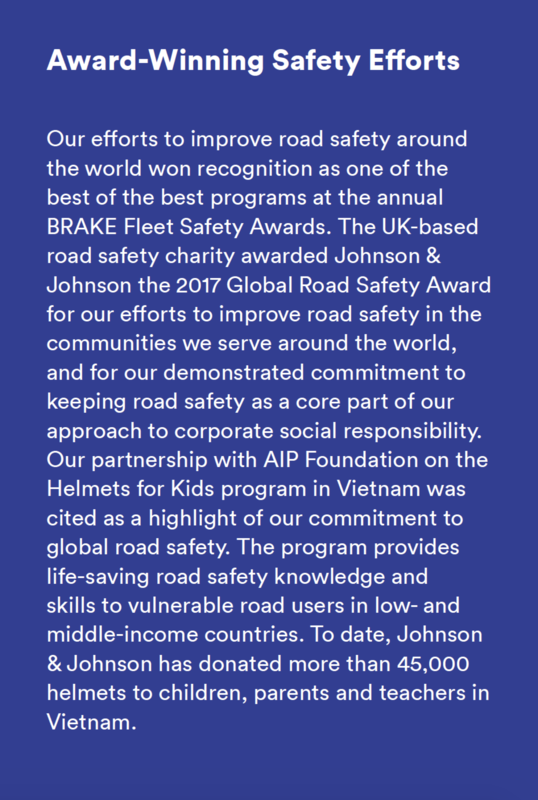 We have a long-standing commitment to global road safety. SAFE Fleet represents our Company's approach to protecting people from injury on the road. To help our employees keep road safety top of mind, 365 days a year, in 2017 we launched a new website called "Safety All Day." The site includes tools and resources for drivers, pedestrians, cyclists and those taking public transportation. It also features infographics, helpful statistics and tips to keep employees and their families safe while on the road. In 2018, the website is being expanded to include additional safety tips that can be shared with family and friends. In 2017, our global Lost Workday Case (LWDC) rate remained flat, at 0.08. The leading causes of LWDC were ergonomics as well as Slips, Trips and Falls, which amounted to 34% and 30% of total number of cases, respectively. 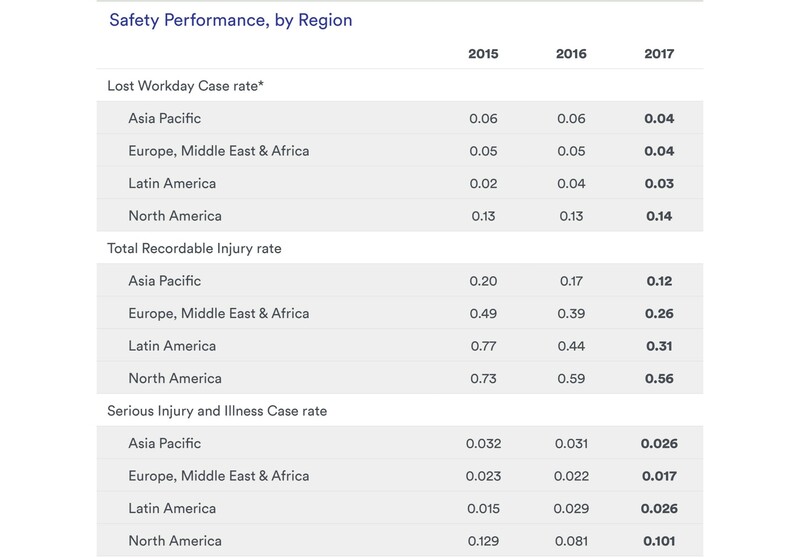 The global Total Recordable Injury Rate (TRIR) decreased from 0.44 in 2016 to 0.36 in 2017. TRIR also decreased across all four regions. We include non-injury type statistics that are classified as “illness,” such as mental-stress cases, in our TRIR. Our global Serious Injury and Illness Case (SIIC) rate remained unchanged at 0.05 in 2017. As in the previous years, our SIIC definition includes conditions that put a greater emphasis on the illness side of the metric, such as hearing loss, disability lasting over 180 days, and surgery that addresses cumulative trauma. We do not track absenteeism at an enterprise level. Occupational disease is also not tracked, since these types of diseases are not prevalent in our workforce. We have extensive health and wellness programs for our employees. See Employee Health & Wellness to learn more. Our global Crashes Per Million Miles (CPPM) and Injuries Per Million Miles (IPMM) rates decreased in 2017 compared with 2016. In addition to monitoring CPPM and IPPM, we continued to strengthen and improve our focus on prevention. Telematics programs are available to drivers in Israel, Japan, Mexico, Portugal, and the United States. We also expanded the Virtual Risk Manager (VRM) platform available in North America to France, Italy and Spain. VRM is a fleet safety management system that captures driver data, such as motor vehicle records (where available and permitted) and crashes/incidents, and assigns driver risk levels. * “Lost days” are calendar days counted beginning the day after an incident has taken place. ** CPMM and IPMM rates are based on SAFE Fleet data. Rate calculation methodology uses both actual and estimated data on miles driven. We collect SAFE Fleet data on employees who drive company-owned or -leased, and personally owned vehicles for Company business. Employees in the latter category are those who: 1) drive for Company business as a “regular part”of their job, and 2) receive a car allowance to purchase their own vehicle, and/or are reimbursed for vehicle expenses such as fuel, maintenance, insurance and other miscellaneous charges associated with vehicle upkeep.